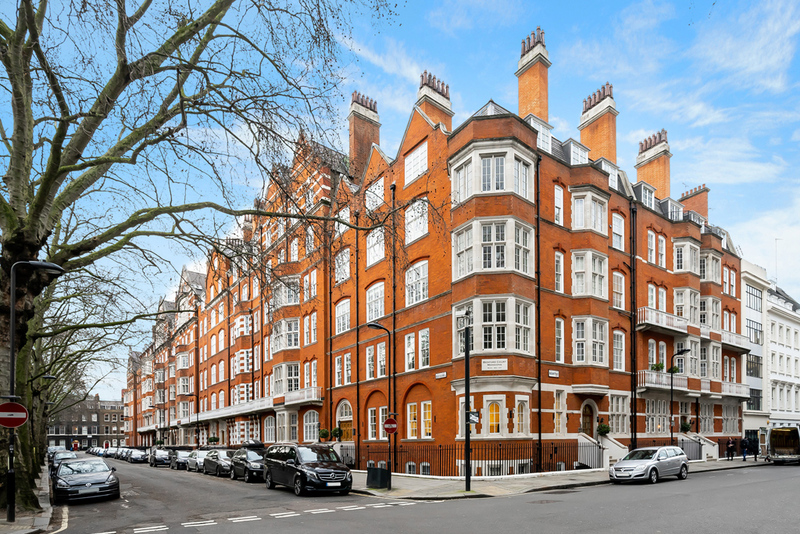 Bedford Court Mansions is a highly sought after red brick Victorian Mansion block located just south of Bedford Square on the tree-lined Bedford Avenue in Bloomsbury. Built in the 1890s originally to provide accommodation for nursing staff at the nearby hospitals. The building was later converted to residential flats with an additional 6 penthouses which were added in the 1970s when the freehold was purchased by the resident management company. The building has a large internal light well to provide brighter living accommodation. The building is currently comprised of 120 residential flats ranging from studio apartments to spacious duplex mansion flats. Originally most would have been much larger mansion flats, however over the years many have since been split in to smaller units. Arranged as four residential blocks over seven floors, the original façade still exists in the fifth block but it was redeveloped behind and now houses offices occupied by Companies House. Hudsons have sold and let many apartments within the building, some many times over as we constantly we receive a high demand in this building, such is the prestige to live there. Residents have the opportunity of aquiring access to the private gardens on Bedford Square, however permission must be sought from The Bedford Estate. The building is currently under going extensive renovation with the addition of a new porters' lodge which will set the bar for other residential buildings in the area. Located in close proximity to Covent Garden, The British Museum, the restaurants, theatres and shopping of the West End. Also the building provides easy access to the City, UCL UCHL and LSE. The building benefits from uniformed porters who operate from Monday to Saturday. Emad - Head porter since 2007 and resident in the building. He has a very hands on approach to the role and is regularly seen carrying out various maintenance jobs around the building. Very personable and popular amongst the buildings residents, one of Emad's passions is for Manchester United football club. Feraz - Has worked alongside Emad since 2007 providing a very reliable team to ensure the residents needs are met and keeping the building safe and secure. Always works with a smile on his face! Keith - New to the team he was previously with the Metropolitan Police. Bringing the skill set learnt in the force to his new role the building is definitely in safe hands. The building will benefit from the Crossrail development and station redevelopment at Tottenham Court Road Underground Station which will see a direct link to Heathrow Airport by 2018. This is the biggest transport investment in the West End for decades. Do you live in Bedford Court Mansions?